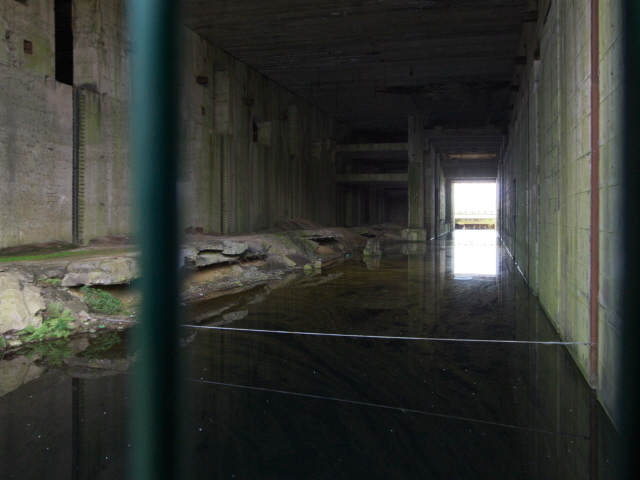 A gargantuan U-boat bunker from WWII near Bremen in northern Germany. Its construction was one of the many last-ditch efforts of the Third Reich to avert the course the war was taking – and like so many such mega-projects it was based on forced labour. Yet it was never finished. 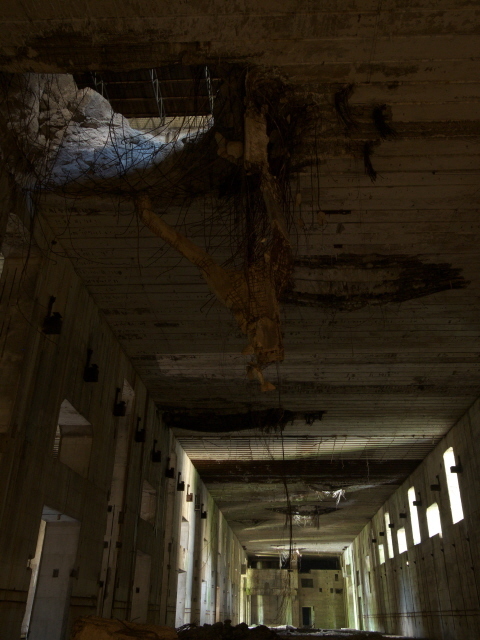 After many years of post-war use as a military storage facility, the whole bunker has now been turned into a memorial. It is certainly one of the most visually stunning sites on German soil today. More background info: The Bunker Valentin is the largest vestige remaining of a whole complex of military constructions in this previously just agricultural rural area outside the city of Bremen. Beginning in the mid-1930s large fuel depots were built, but very little of these remains today. Construction of the “U-Boot” ('U-boat' = submarine) bunker began in 1943. At that time the fortunes of war had begun to turn heavily against Nazi Germany, and Allied aerial bombardments of the main cities and industrial centres, including harbours, made these places vulnerable. 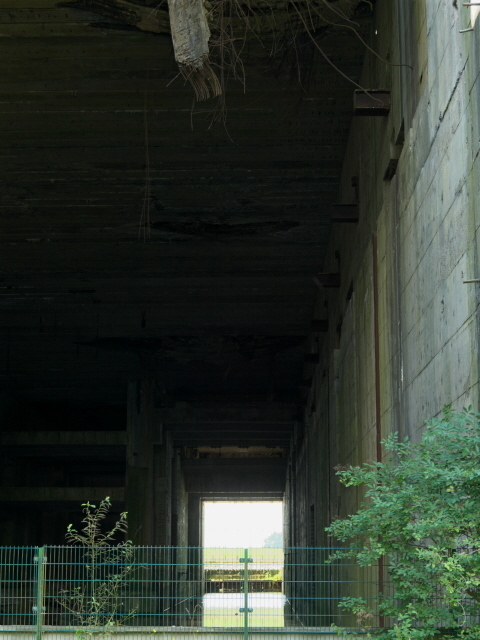 So it was decided to construct this massive shipyard bunker of reinforced concrete here, quite a bit downriver from Bremen and right on the banks of the River Weser. 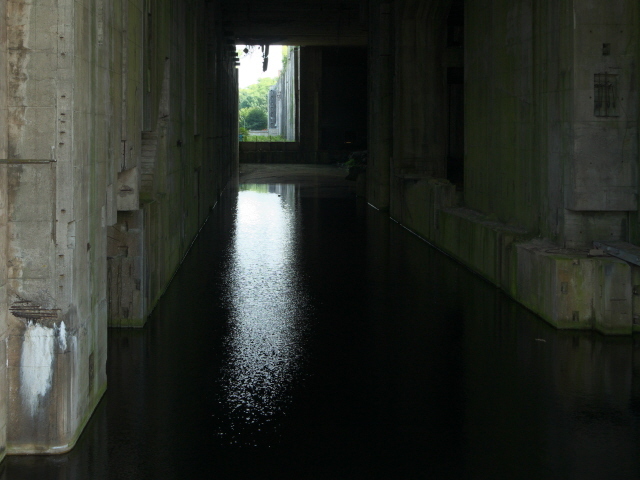 It was intended as a production site for the new and highly advanced Type XXI submarines, but it never came to it. Before a single submarine's keel could be laid here, the Third Reich was defeated and the war was over. Yet its nearly-completed hulk is the second largest above-ground bunker anywhere in Europe still today. Construction started in the summer of 1943 – and, as usual in these huge projects overseen by the Nazis' “Organisation Todt”, the workforce was primarily made up of forced labourers: POWs and concentration camp inmates. These came from a range of countries, primarily France, Italy, Poland and the Soviet Union. The associated prison camp near the construction site became the largest subcamp of the Neuengamme concentration camp in Hamburg. The Gestapo also had a “re-education camp” near the site. Predictably, working and living conditions were atrocious, and it is estimated that between 1500 and 6000 workers died during the construction of Bunker Valentin. Shortly after the bombing attacks the final construction work was halted and the bunker site given up (and forced labourers sent on death marches to Neuengamme and Sandbostel). Less than a month later the whole area was liberated by the British Army, following the capture of Bremen. 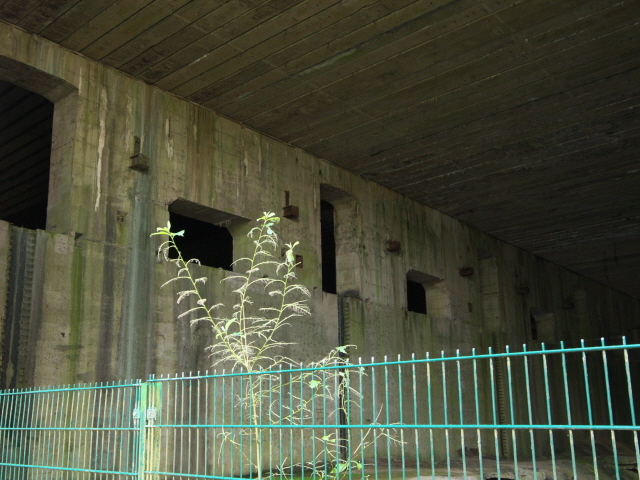 After WWII the Allies first used the bunker as a practice bombing target, then it was just abandoned (and became an adventure playground for local kids). 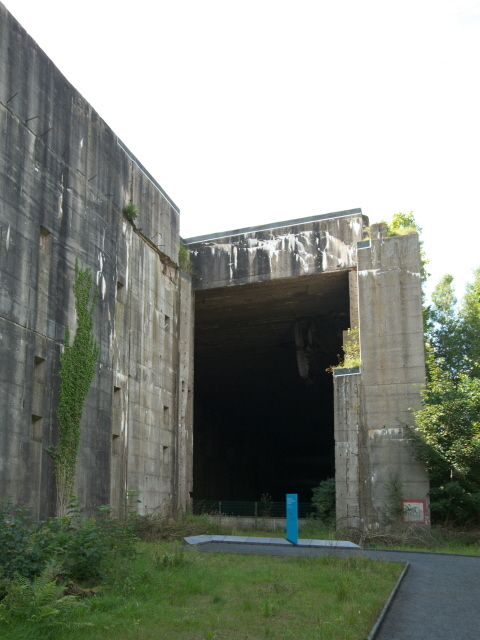 At the end of the 1950s the bunker was again given a military role, although this time a far more harmless one: the German Navy (Bundesmarine) used the eastern section of the bunker as a storage facility, while the areas of the former fuel tank depots and the camps were taken over by the Army as a training ground. In 1983, after long and difficult campaigning, at least a small memorial monument was erected just outside the bunker. It is entitled “Vernichtung durch Arbeit” (the line used by the Nazis to refer to systematically working forced labourers to death). 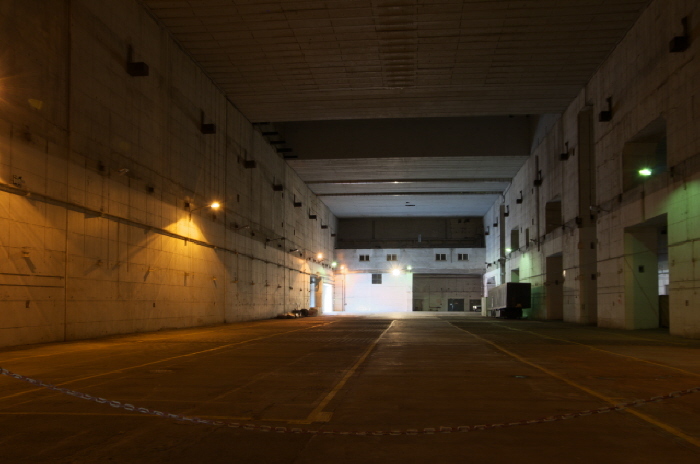 Between 1999 and 2005 parts of the bunker were used as a theatre set, namely for the staging of the anti-war drama “The Last Days of Mankind” by Karl Kraus. There had long been campaigns for turning the whole bunker site into some kind of proper, permanent memorial, and when the Navy finally moved out of Bunker Valentin in 2010, more concrete plans began to be drawn up. This eventually yielded the present commodification of the site: the “Denkort” (= 'memorial', 'commemoration space') which opened in late 2015. 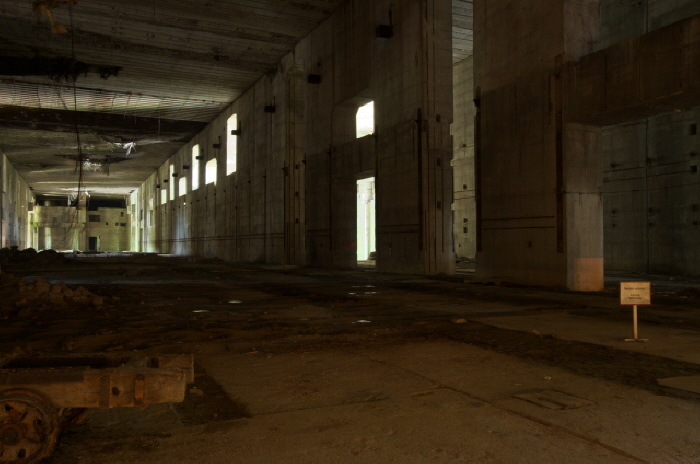 Parts of the eastern section of the bunker are still in use for storage and are rented out for that purpose by the German government. But this doesn't unduly interfere with the memorial. What there is to see: Before going into the memorial site proper you should have a quick look at the older monument that was erected in 1983 opposite the gate. There are a few memorial plaques at the foot of the monument and usually a couple of wreaths and/or rings of poppies. The self-guided circuit around and through Bunker Valentin first takes you round to the left from the eastern end of the big grey monster edifice and halfway down its southern side. All along the way there are information panels about various aspects of the bunker and its history, in part illustrated by reproductions of historical photos. All of the labels and explanatory texts are bilingual in German and English. The entrance to the inside is about halfway down the side of the bunker where the western and eastern sections meet. The spacious atrium already gives visitors an impression of the dimensions on the inside. Apart from the reception desk (where you can borrow audio-guides if you wish – I declined the offer), the main thing here is a large “Medientisch”, basically a large screen-like slab in the shape of a tilted table on which a loop of an animations of the different phases of the bunker's history and that of the whole area is played, and in parallel images are projected onto the wall opposite. It is worth seeing the entire thing! It provides vital background info in an easy to digest visually enhanced format. In a side room, a new exhibition is also a valuable add-on, although I found it on balance a little thin with regard to artefacts on display and breadth of the information provided. Amongst the few original objects displayed is a concrete fence post from one of the forced labour camps associated with the construction site of Bunker Valentin. These are also illustrated through drawings, documents and photos. Another remarkable artefact, though much smaller, is a delicately engraved tin cigarette case made by an Italian prisoner that he exchanged for some bread from a German apprentice (who then, so many decades later, donated it to this memorial). 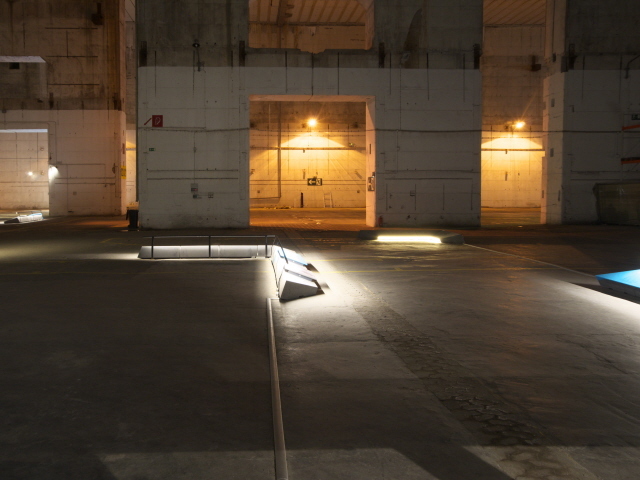 The exhibition also covers the long campaign for turning the bunker into a memorial of some kind – which for many years collided with the resumed military use of the bunker by the German Bundesmarine (Navy). On display from those days is an old sign saying 'military area – no access to unauthorized persons – offenders will be prosecuted'. Also covered in the exhibition is the mythical appeal of the world of submariners, illustrated, for instance, in successful movies on the subject such as “Das Boot” (1981, directed by Wolfgang Petersen). Film posters and scale model kits of submarines are on display. From the exhibition room you can see into the damaged, inaccessible bunker parts beyond, but only through a glass wall … the view gets better later on in the circuit. The circuit through the bunker then commences in the eastern section, parts of which are still in use for storage purposes. So you can occasionally see lorries coming and going, which adds an unexpected industrial acoustic element to the site. 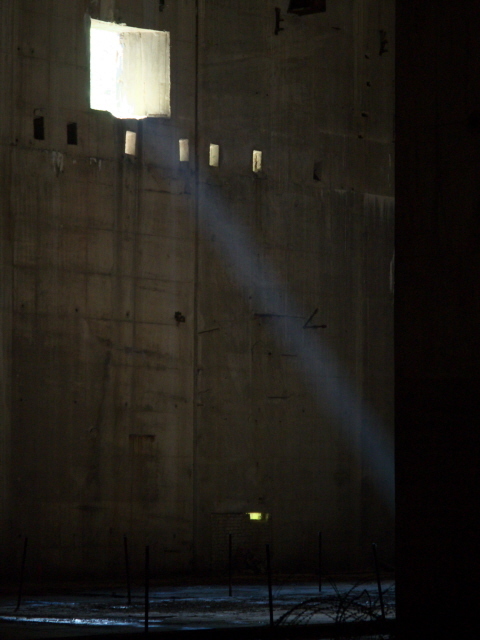 This was the part restored for storage purposes – for which the separation wall between the two main sections was also added. 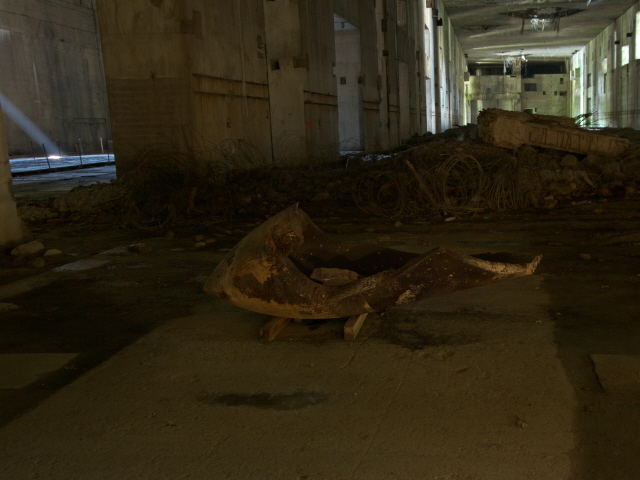 So these days you only get half the spacious impression of what was to be the U-boat shipyard production hall. On the floor just beyond the barrier are also a couple of objects of note, including a bent bomb casing from the period when the Allies used the bunker for target practice immediately after WWII. Another is the chassis of a tipper wagon, an original relic from the Bunker Valentin construction site from 1944. The circuit then leads back outside. You then come to the rear of the sluice chamber of the bunker, i.e. the place where the finished U-boats would have been launched and sent off to sea. It is still filled with (rather dirty looking) water. 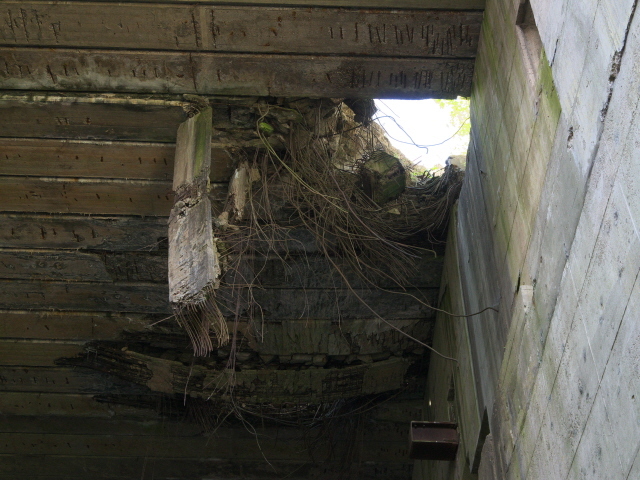 You can also spot yet more bomb damage here. The path then leads past the foundations and ruins of what used to be a concrete mixing plant serving the construction site. 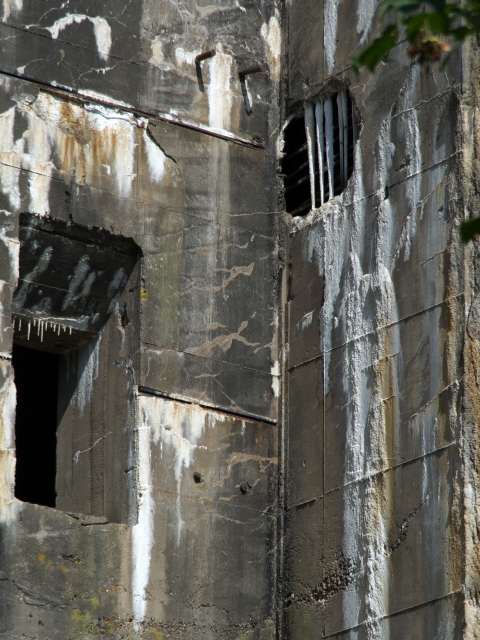 A few info panels illustrate what the construction site and its support facilities north of the bunker consisted of – today nothing at all of this remains. The area has been reclaimed for agricultural use. 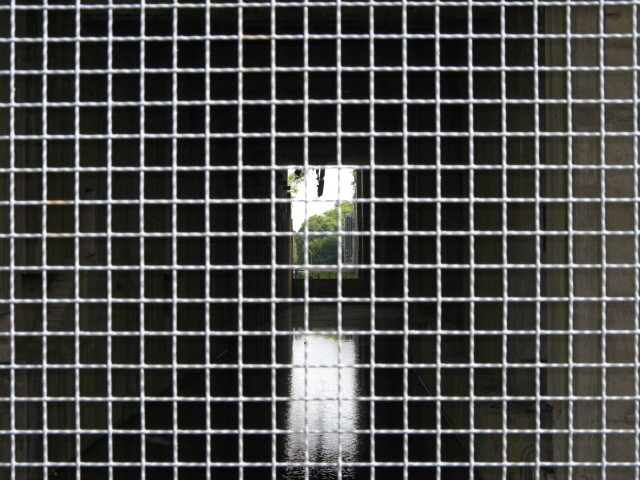 Eventually you come to the front of the sluice chamber or dock. Through the fence you get an even better view of this chamber from here. The dock's connection with the river, however, is interrupted by the dyke along the embankment of the River Weser. In fact the final cut to link the dock with the river was never carried out – but the bay in front of it had been specifically dredged for the bunker shipyard. From the crest of the dyke you can see the bay and the river and there's a small beach that people were using for typical beach recreation when I was there. Pleasure boats are also cruising around. It's quite an odd contrast to the dark and brooding bunker just on the other side of the dyke. The final part of the circuit then leads along the western and southern facade of the monstrous bunker and eventually takes you back to where it joins the first part of the circuit by the entrance to the exhibition/indoor parts. 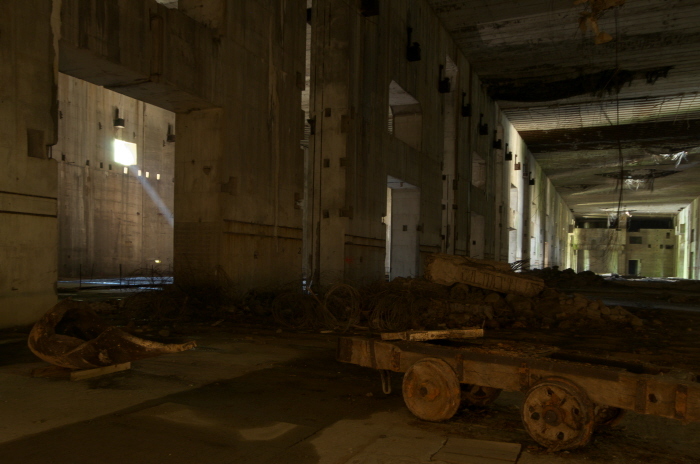 En route you pass a huge opening on the side of the bunker – this was to be the gate through which prefabricated parts of the U-boats would have been delivered to the bunker shipyard for assembly. All in all, I found Bunker Valentin hugely impressive. First and foremost this is undeniably due to the sheer dimensions of this grey concrete monster, and further enhanced by the visually dramatic evidence of bomb damage in the western section. But the commodification, telling the stories of the victims and providing background info to all manner of subtopics related to this site, is also very well made. Even if the actual exhibition part was much smaller and lacking in substance than I had expected. But this is more than compensated for by all the info panels along the circuit around and through the bunker. So, on balance, highly recommendable! Location: at Rekumer Siel, right on the north-western edge of the municipal area of Bremen, north Germany, on the banks of the River Weser. Access and costs: Quite a bit off the beaten track and far from the city centre of Bremen, yet reachable by public transport; free. Details: Even though the bunker is so far out on the edge of the city, getting there is made possible by Bremen's public transport system. And it's relatively easy, even though it's time-consuming, but at just 2.70 EUR each way (at the time I went, summer 2016) it's also quite affordable. First get a regional train (NWB RS1) from Bremen central station (Hauptbahnhof) to take you to Bremen-Farge (via Bremen-Vegesack). From there get bus line 90 in the direction of Neuenkirchen and get out at the stop Rekumer Siel. From here it's a short, ca. 200 yards walk down the street of that same name to the gate of the bunker memorial complex. Coming by car from Bremen, take the city motorway A270 to its end at Farge when it becomes the the B74n bypass that joins the B74 proper and becomes Farger Straße. At the next major intersection, stay on Farger Straße straight on (i.e. not following the B74 left to the Weser ferry! ); eventually this becomes Rekumer Straße. Follow this for another 1.3 km (a bit under a mile) and look out for the signs. Turn left onto Rekumer Siel and carry on until you see the big grey hulk of the bunker. There are a few parking spaces to the right outside the gate and a few more inside the compound (though I'm not sure whether any restrictions apply to the latter). Parking is free. The circuit round the site begins to the left of the complex, NOT through the gate (as a sufficient number of signs point out). The whole circuit is about a mile (1.5 km) long). An audio-guide is available for free as well, but a deposit is required. I didn't use one myself, but I gathered that it must also be available in English, because a group of South Africans arrived shortly after I did, who asked in English and were given one at the reception desk. Time required: Between half an hour (for just a quick look) and two hours or more if you want to read everything and use the audio-guide. Combinations with other dark destinations: Dotted around the areas of the former prisoner camps associated with the construction of the bunker, as well as at the former fuel tank depot, a few more or less obscure relics can still be found. There are some information panels along hiking trails that lead to these locations, but some of these may be a bit tricky to find without a good knowledge of the territory. For that reason, the Bunker Valentin Memorial also offers guided tours of these outdoor locations. But they have to be arranged in advance, and I don't know if they can provide this kind of service in languages other than German. You would have to contact them and enquire. There's also a separate “Verein Geschichtslehrpfad” (roughly ' historical education trail association') that offers maps and information about the area. They also acquired one of the old barracks (Baracke 27) of one of the camps where they installed their own historical exhibition. But this is only open occasionally, and as far as I can see all their services are available in German only. The nearest major dark destination outside the Bremen area itself is the former POW camp of Sandbostel, which in recent years has seen a lot of developments and refurbishment and can only be recommended. But you'll need a car to get there. Also within relatively easy reach (also by train) from Bremen/Farge is the (thematically unrelated) German Emigration Centre in Bremerhaven. And when in Bremerhaven you could also visit the “Deutsches Schiffahrtsmuseum” ('German Maritime Museum') and the U-Boat “Wilhelm Bauer” next to it. This is the only Type XXI submarine still afloat, though in slightly modified form (from when it was in service as a research and testing vessel of the German Navy between 1960 and 1982). It is now a museum piece on public display that can be visited, also the inside, between mid-March and early November (daily 10 a.m. to 6 p.m., in summer to 7 p.m., 3.50 EUR). For more sites further afield see under Germany in general. Combinations with non-dark destinations: Most obviously the Hanseatic city of Bremen itself! The rather compact old city centre has some very picturesque bits and some of the districts around it are quite pleasant too. The main attractions include the brick cathedral and the “Rathaus” (City Hall) – both contrasting sharply with the modern architecture of the “Bürgerschaft” (City Senate) next door. Also of note is the “Bremer Stadtmusikanten” ('Town Musicians of Bremen') sculpture, which depicts a fairy tale by the Brothers Grimm in which a donkey, a dog, a cat and a rooster team up to seek freedom in the city. It's also a reference to Bremen's long-standing status as a “Freie Hansestadt”, a free Hanseatic city. It still forms one of the federal states of modern Germany, one of only two city states in the FRG (the other being the equally Free, and much larger, Hanseatic city of Hamburg). Another particular attraction of old Bremen is also the little Schnoor quarter, a warren of little cobbled alleys and low (mostly single or two-to-three-storey) brick and half-timbered houses and cottages.